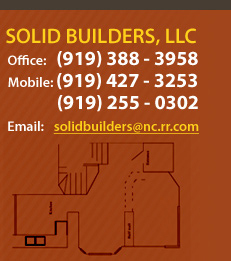 Solid Builders was formed in 2003 by Raleigh native Aaron Miller with the mission to provide homeowners in the Triangle with quality craftsmanship, innovative design and superior customer service. With eighteen years of hands on experience and the use of high quality materials and staffing, Solid Builders continues to impress each and every customer with a final product that satisfies their needs and expectations. As people who appreciate Mother Nature, Solid Builders offers our clients the opportunity to capitalize on green building practices. Ask us how these options can help you save money, receive tax credits, create a more energy efficient home all the while promoting environmental stewardship. Our number one goal with every project is to satisfy you the customer and for that reason all our work is guaranteed. We achieve this goal through our core values and solid business practices featured below. Genuine: We are sincere, trustworthy and reliable. Running each project with integrity, and treating you and your home with the upmost respect is a priority. Innovative: We offer custom designs to suit your needs. We stay abreast with the latest trends and product diversity so your home is unique and timeless. Thorough: We make sure every �I� is dotted and �T� is crossed throughout every aspect of the project. From working with you on material selections to our methods of protecting and securing your home during construction to the final cleanup and client walk through. We make sure you are 100% satisfied. Exceptional: We focus on providing top quality product and service at affordable prices. We employ highly skilled carpenters and only hire licensed and qualified subcontractors to complete our projects. 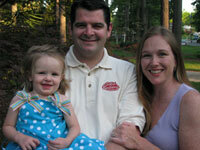 Ethical: We are a fully certified NC General Contractor. *(in NC you are required to have a General Contractor�s license for projects that exceed $30,000) We carry a full insurance policy including workers compensation (this alleviates your liability) and general liability. We see that all necessary permits are in place for your project.  Very good experience. Easy to work with, did the work well. Absolutely would call them again.